It’s Psychedelic Baby is an independent music magazine, covering alternative, underground, non-commercial and non-mainstream artists in variety of shapes and genres. Exclusive interviews, reviews, articles and premieres. A place where musicians can express themselves. We serve an international readership. Founded in 2010 by Klemen Breznikar. Worldwide community of writers. Among them are Jenell Kesler, Jeff Penczak, Brian R. Banks, Joeri Bruyninckx, Ross Beattie, Justin Jackley, Kevin Rathert, Roman Rathert, Beverly Paterson, Brian Greene, Matt Yablonski, Lenny Helsing, Kevin F. Wozniak, Peter Markovski, Sébastien Métens, Brock Silversides, Gabe Kahan, Carlos Ferreira, Tom Hanno and many others. Our interviews appeared or were quoted by many worldwide publications, including The Wall Street Journal, The New York Times, Ultimate Classic Rock, Metal Injection, Dangerous Minds and also in documentary We Intend To Cause Havoc. Klemen Breznikar interviewed me for his nicely presented It’s Psychedelic Baby Magazine. The questions were in depth and interesting. I do many interviews around the World, and it’s refreshing for me to answer these sort of more original questions. Much of the magazine seems to include points of interest, and I really like the Artwork. My name is Mark Andes and I was interviewed by Klemen Breznikar for his publication It’s Psychedelic Baby Magazine and was impressed by Klemen’s professionalism and insightful questions. His familiarity with the subject matter was obvious and the result was an interview that was forthright, honest and a lot of fun. It’s Psychedelic Baby Magazine is good for music! I’m a fan of Klemen’s work. Klemen Breznikar has produced a website that has become an essential source of information for scholars of international underground music culture from the ’60s through to the present. In the same way that American ethnomusicologist Alan Lomax collected music in the 1930s/1940s to create an invaluable source for historians, Klemen has interviewed many well known and lesser known artists particularly from the ’60s and ’70s capturing their memories of that important era so that they are available to future musicologists and historians. He has interviewed artists from all over the world many of whom had never been interviewed before even though their work was known to international music collectors. This is an invaluable and important service and he is now regarded as an authority on psychedelic and progressive rock music. His website has published over 2500 articles and 1100 interviews and is a staggering achievement. I have known Klemen Breznikar through his Magazine It’s Psychedelic Baby Magazine, I think he originally approached me to do an interview for him, which I did, and loved, and then another Interview, and was always impressed with his imagination and outrageousness in his publications, and the excitement which he generated. I loved it all, keep on Rocking Klemen. …..during all times artists express their Inner nature through painting, sound and words. Later through photography and movie. From time to time we are asked why we do it and how we do it. We usually like such requests. Especially when emphatically asked with respect and background knowledge for the art. Of such kind is the journalist Klemen Breznikar. Klemen Breznikar, just wanted to say how much I appreciated the work you put into the interview. It was wonderful to see it laid out in such a manner that was no only easy to follow, but had photos that really matched the era of the dialog. When I read it through, I was able to appreciate your efforts to be accurate in your journalism. I put the link on my Facebook page and it was received quite well. I’ve been lucky to have been interviewed by Klemen & It’s Psychedelic Baby Magazine for my band Earthless and also have been following his stuff for years. For the music I am into it is a daily new source of information and fun facts about bands that have been obscured by time. As a performing musician for 50 years, and someone who reads reviews, blogs, and information about many musical and historical subjects, I find that Klemen Breznikar’s articles and approach are always original and very entertaining. It’s Psychedelic Baby magazine is a much needed online journal that displays his deeply felt love of a great period in musical history. His excellent writing and editorial judgement makes it very readable and fun for anyone interested, musician and non-musician alike. I am pleased to write a letter of support for Klemen Breznikar. Klemen is a much-respected and internationally known writer, editor and publisher. His online magazine It’s Psychedelic Baby has been in existence for over nine years, and has become one of the world’s most important sources for the history of popular and alternative music. Its coverage is truly cosmopolitan, and its audience runs the continuum from casual reader to music scholar. It has also become an outlet for first-time writers and musicians, their offerings being encouraged and skillfully shaped by Klemen, while letting them retain their own personal style. Not to be overlooked, the magazine also includes numerous fascinating and valuable interviews with both famous and obscure artists – conversations that cannot be found anywhere else. The world of music journalism would be much poorer if Klemen and his publishing efforts were not around. Without independent music journalism artist like myself would stay berried under the passing of time. Klemen Breznikar’s research picked up the story from journalist Matt Procak. Matt acquired and presented both LPs to Guerssen Records for reissue. The story of 1969 Ode To Quetzalcoatl and Harbinger, LPs was resurrected in 2007 By Guerssen records, then It’s Psychedelic Baby Magazine. The interview was simple, comprehensive and to the point. Klemen asks questions his readers want to know. Psychedelic Baby Magazine made my music global. The interview served as a resume for music venues to book me, bringing me to a European tour again this year. I have given a lot of interviews but this one has endured. I enjoy a rewarding career for works of music I wrote and recorded when I was just out of High school 1968. I’d like to support Klemen Breznikar’s excellent and useful work; the site is an invaluable resource and his interviews ask the right questions – the ones people actually want to know the answers to. Independent journalism of this quality is not so common and KB works hard to collect information and pass it on. With best regards, Chris Cutler. Klemen Breznikar conducted two “Artist Interviews” with me which were published in the “It’s Psychedelic Baby magazine. In addition, Klemen published a book-zine about Psychedelic Folk music, and a chapter covering my music work, was included in the publication. More recently, Klemen served as the curator for my latest album release “One Man’s Journey” on the Sundazed / Modern Harmonic record label. Klemen led the drafting of the LP and CD album liner notes, and delivered great results. It’s important to support project like this as Slovenia is young country, full of young energy flow. I performed in Slovenia few times, I was surprised there was good amounts of listener visited my kind of music that is no popular at all. It’s work/results of the web like this bring/connect people. Actual Information, international value in English….. I feel positive energy. The work and labor of Klemen Breznikar for his It’s Psychedelic Baby blog and magazine is of great importance to music aficionados worldwide: thanks to him, musicians from the golden years of rock music (the 60s-70s), have the chance to tell their stories first-hand and it’s also a highly recommended site if you want to be informed about current bands which are influenced by music from the past decades. From its humble beginnings, thanks to the passion and hard work of Klemen, I’t Psychedelic Baby has grown to be one of the leading sites regarding psychedelic and underground rock music and he’s been able to create a tight community worldwide. For many years Klemen Breznikar has been invaluable in documenting the history of psychedelic music through his relentless work as an independent journalist and founder of It’s Psychedelic Baby Magazine. The psychedelic rock music scene had cultural and historic significance beyond mere entertainment. It is essential that the stories of key artists who did not achieve fame be documented. Klemen does that better than anybody else I know of. In simple words, I would like to tell here how much I appreciate the great professionalism that manifest Mr. Klemen Breznikar in his many interviews of major musicians of the rock pop musical scene, not only the most famous of them, but also the wide range of composers and bands, various kinds of groups and soloists that Klemen Breznikar is selecting to inform people and music lovers all over the world through his magazine It’s Psychedelic Baby Magazine (unique of this kind in the world) about the great proliferation of new forms of music and experimentations happening nowadays…and that can be known for the public only if some excellent and specialised journalist as Klemen Breznikar is informing us, including myself; without him, without his great intellectual and insatiable curiosity, his great love for music, his great knowledge also about the works of each musician, each band, group, soloist, singer, composer, it would be almost impossible to understand and follow the continuous flow of music creativity that everyday enrich and nurture the mind and soul of the populations, youngsters and adults as well. 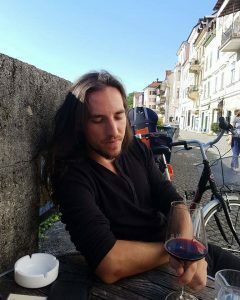 What is very impressive with Klemen Breznikar, is his wide knowledge of the history of pop-rock culture, but not only: jazz, classical, progressive music, electronic music, underground and alternative, all the musics are alive in his heart and mind and exciting his imagination and curiosity. The questions that he is selecting and propose to give to the musicians the possibility to express themselves in total freedom and develop in front of the public the spirit of their work, unveiling also some unknown biographical details sometimes, provides a very precious tool of investigation to all of us and to the national culture and archives of a particular country. I want also to emphisaze the great work who is done by Klemen Breznikar to present his magazine with a lot of very interesting visuals, photos, archives, covers of the vinyl albums and many graphics of great interest on the esthetical point of view. He is very attentive to all the details of his magazine presentation and manifest – I repeat – a great professionalism in his journalistic activities. I don’t hesitate to write that Mr. KLEMEN BREZNIKAR is really a talented journalist and a great connoisseur of his subjects, a great expert in music at large, focusing particularly on the poprock scene and the psychedelic spirit. Behind this idiom of ‘psychedelic’ is included many and various forms of artistic and esthetic ways of thinking and creativity gathered under the vocable of ‘psychic’. A society needs people like Klemen Breznikar, and mostly the world of the media.